Did you know that 1 in 10 people over 50 years old in Australia are diagnosed with Osteoporosis (Australian Institute of Health & Welfare). However, due to the silent nature of the disease, there is likely to be many more people living with osteoporosis who are undiagnosed. Unfortunately, women are 4 times more likely to have Osteoporosis than men (Australian Institute of Health & Welfare). Osteopenia is a term used when our bones are weaker and have a lower bone density than normal, however not low enough to be osteoporotic (Osteoporosis Australia). Where as, Osteoporosis is the loss of bone thickness or mass, where bones become more fragile and weak and are at a higher risk of fracturing (Osteoporosis Australia). Bone density is determined using a Dual-energy X-ray Absorptiometry, more commonly known as a DEXA scan. 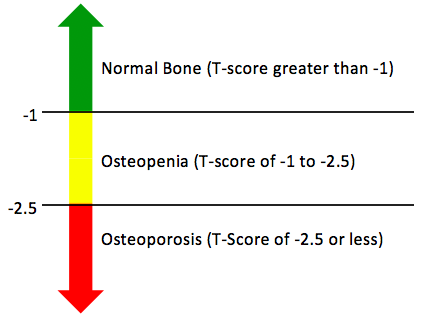 Normal healthy bone has a T-score of -1 or more; Osteopenia -1 to -2.5 and Osteoporosis is diagnosed when you have a t-score of less than -2.5 (Exercise is Medicine). It is not uncommon that different bones in our body can have different T-scores, for example, our hip may be weaker and more fragile than other areas like our wrist or spine, therefore the hip is at a greater risk of fracture. Weight – thin body build or excessive weight. If you have one or more of these risk factors, it is recommended that you see and talk to your GP about having a DEXA scan to determine your bone density. Exercise plays a large role in forming and maintaining healthy and strong bones throughout our whole lifespan, from babies to elderly (Figure 1). 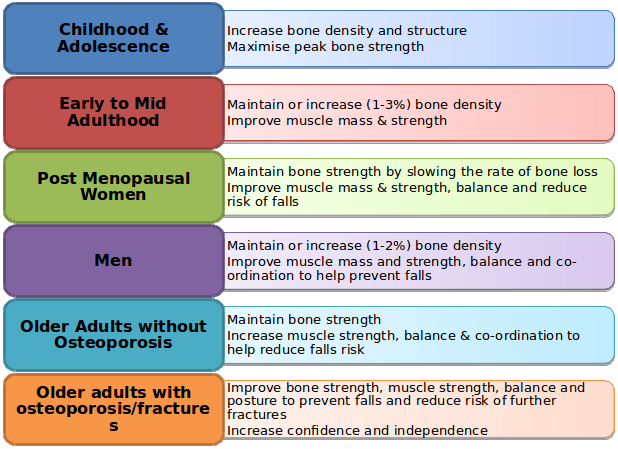 We reach our peak bone mass around our late 20’s and slowly start to lose bone mass as we age, beginning in our 30’s and 40’s (Osteoporosis Aus, Exercise is Medicine). Regular exercise is one of the most effective ways to maintain a high bone density, as well as prevent the loss of bone mass. When we exercise, we are loading and shocking our bones, causing them to slightly deform or bend a tiny amount (Exercise is Medicine). This stimulates them to grow and harden to protect them against future injury (Exercise is Medicine). As well as keeping healthy bones, exercise also plays an important role in increasing muscle strength, healthy body composition and especially balance and co-ordination, which are essential as we age to reduce the risk of falling, which may result in fractures. It is recommended that people with Osteoporosis exercise 4-5 times per week for a minimum of 40 minutes per session. This should include a minimum of 3 individually tailored resistance-training sessions (Exercise is Medicine). 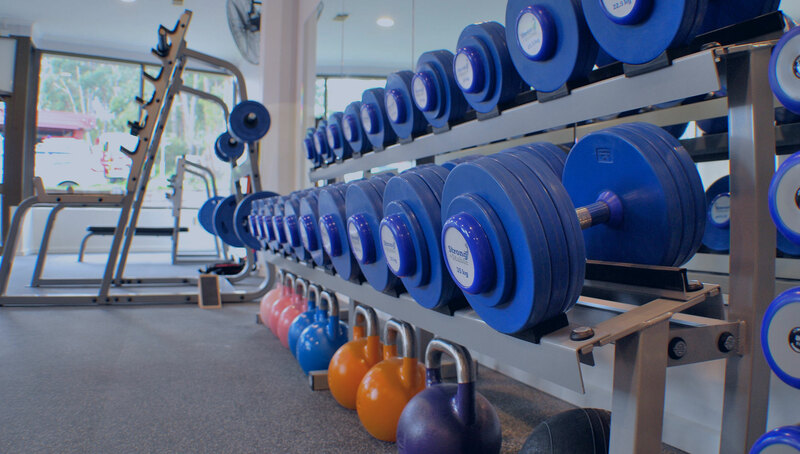 If you are interested in learning more about how exercises can assist you with your bone health or for assistance in designing an individually tailored exercise program, contact Strong and Stable on 9762 0976 or via email at info@strongandstable.com.au.